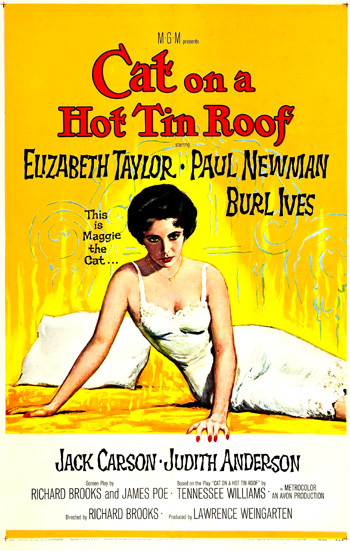 Cat On a Hot Tin Roof (1958) is the powerful, highly-charged, moving story of a neurotic, dysfunctional Southern family with its rivalries, tensions, and avarice. Its provocative screenplay by Richard Brooks and James Poe was adapted from the Pulitzer Prize-winning play of the same name by Tennessee Williams. [It was Williams' second Pulitzer Prize win.] MGM's posters proclaimed: "ALL THE SULTRY EXPLOSIVE DRAMA OF TENNESSEE WILLIAMS' PULITZER PRIZE PLAY IS NOW ON THE SCREEN." A sexually-explicit, made-for TV remake was created in 1976, starring Robert Wagner, Natalie Wood, Maureen Stapleton and Laurence Olivier in the lead roles. A second made-for-TV production was co-produced by pay-cable station Showtime and PBS's American Playhouse in 1984, starred Tommy Lee Jones, Jessica Lange, Rip Torn, and Kim Stanley. The film, one of the top ten box-office hits of its year, was honored with six major Academy Award nominations, including Best Picture, Best Actor (Paul Newman with his first Oscar nomination), Best Actress (Elizabeth Taylor with her second of four consecutive nominations), Best Director (Richard Brooks, who had replaced George Cukor as the film's original directorial choice), Best Adapted Screenplay (Richard Brooks and James Poe), and Best Cinematography (William H. Daniels) - but it failed to win any awards. Curiously, Burl Ives was nominated and won an Oscar in 1958 as Best Supporting Actor in The Big Country rather than for his performance in Cat On a Hot Tin Roof. The play was originally directed by film director Elia Kazan, starring Ben Gazzara, Barbara Bel Geddes, Burl Ives, and Mildred Dunnock - with Ives as the only one reprising his role in the film version. Because of strict censorship Production Codes in the late 1950s at the height of Hollywood's concern about film content, all references to homosexuality and four-letter words were deleted, watered down, or obscured from the shocking, original play, and the ending was considerably changed from the original Tennessee Williams play. Major star Elizabeth Taylor was deeply affected by the tragic airplane crash death of her husband Mike Todd, only a little over a week into the shooting. Her role was as the passionate, sexually-frustrated, feline Maggie ("The Cat" in the film's title) whose advances and lustful sensuality are thwarted by the unloving temperament of her alcoholic, injured, impotent, and apathetic husband Brick (Paul Newman) who is still suffering from the suicidal death of his (homosexual) friend Skipper, and also has suffered a broken ankle. [In the play, Maggie had allegedly seduced Skipper, an instance of heterosexual infidelity - to keep their homosexual relationship at bay - an important plot element missing in the film.] The action occurs on the occasion of the 65th birthday of 'Big Daddy' Pollitt (Burl Ives reprising his stage role) - the patriarchal plantation head (who is secretly suffering from terminal cancer), when the greater Pollitt family gathers and inevitably quarrels - greedily - over the granting of the expected inheritance. The film opens in the middle of the night (3 am in the morning) with Brick Pollitt (Paul Newman), a good-looking but tormented, brooding, boozing, ex-high school football star, setting up hurdles on a track next to the football field of his alma mater - East Mississippi High School. After hearing the imaginary encouraging cheers of an audience in the stands, the scene of his past glories, he hears the starting gun and leaps forward in an attempt to relive the glory days of his athletic youth. He crashes and stumbles to the ground over the fourth high hurdle, and from the ground looks up at the empty seats in the stadium. In the following scene the next day, he is confined to the second-floor bedroom/sitting room of the Pollitt plantation mansion with a broken ankle. One of those no-neck monsters hit me with some ice cream. Their fat little heads sit on their fat little bodies without a bit of connection...you can't wring their necks if they got no necks to wring. Isn't that right, honey?...Think of it, they've got five monsters and number six comin' up. You'd be a perfect candidate for Rainbow Hill. That's where Brother Man gonna tell Big Daddy to ship you. Over my dead body...And if they get you out of the way, Brother Gooper gets ahold of the estate and signs all the checks and cuts off our credit whenever he wants. How'd you like that, Baby? Big Daddy dotes on you, honey. And he just can't stand Brother Man and Brother Man's wife, that monster of fertility. She's downright odious to him. I can tell. Just like I can tell he likes me. That's the second thing we got on our side. He likes me. The way he looks me up and down, over, he's still got an eye for girls. Although Brick thinks her "kind of talk is disgusting," she feels he is a "back-aching Puritan." Love-starved from Brick, she admires her father-in-law's lechery, believing that he finds her sexually attractive: "I think it's mighty fine the way that ole fellow on the doorstep of death still takes in my shape with what I consider deserved appreciation." Maggie: Like you were just lookin'. Brick: I wasn't conscious of lookin' at you, Maggie. Brick: Will you please keep your voice down. Maggie: No! I know you better than you think. I've seen that look before. And I know what it used to mean. And it still means the same thing now. Brick: (cooly detached) Know what, Maggie? Maggie: That I've gone through this horrible transformation, that I've become hard and frantic and cruel...Oh Brick, I get so lonely. Maggie: Living with somebody you love can be lonelier than living entirely alone - if the one you love doesn't love you. Brick: ...Would you like to live alone, Maggie? Maggie: No! No, I wouldn't. Maggie: Why can't you lose your good looks, Brick? Most drinkin' men lose theirs. Why can't you? I think you've even gotten better-lookin' since you went on the bottle. (As she caresses the brass bedframe) You were such a wonderful lover...You were so excitin' to be in love with. Mostly, I guess, 'cause you were (pause)...If I thought you'd never never make love to me again (pause)...why I'd find me the longest, sharpest knife I could and I'd stick it straight into my heart. I'd do that. Oh Brick, how long does this have to go on? This punishment? Haven't I served my term? Can't I apply for a pardon? Brick: Lately, that finishin' school voice of yours sounds like you was runnin' upstairs to tell somebody the house is on fire. Maggie: Is it any wonder? You know what I feel like? I feel all the time like a cat on a hot tin roof. Brick (offering a solution): Then jump off the roof, Maggie, jump off it. Now cats jump off roofs and they land uninjured. Do it. Jump. Maggie: Jump where? Into what? Maggie (angrily): I don't deserve that! I can't see any man but you. With my eyes closed, I just see you. Why can't you get ugly Brick? Why can't you please get fat or ugly or somethin' so I can stand it? Brick: You'll make out fine. Your kind always does. Maggie: Oh, I'm more determined than you think. I'll win all right. Maggie: Just stayin' on it, I guess. As long as she can. Big Daddy's arrival at the airport is met with a fanfare from Gooper, Mae, their children, and Maggie. Using all weapons at her disposal to curry favor with Big Daddy, Mae has her brood of five children play 'Dixie' on a combination of instruments to greet him. Big Daddy's wife "Big Mama" Ida (Judith Anderson) joyfully delivers jubilant news about his medical report: "The exploratory operation proved there's nothin' wrong with Big Daddy. Nothin' at all. Just a little ol' spastic colon and that's all." Maggie tells her admiring father-in-law: "That's the best birthday present of all." After getting a ride back home with Maggie, the crochety old Big Daddy, an immense rotund man, has a new lease on life with a clean bill of health: "Well, I'm gonna live, Maggie, I'm gonna live. You know, they had me real scared. You know, I've wasted so much time, you know, I've got a million different kinds of feelings left in me. And I want to use 'em. I want to use 'em all." Big Daddy: Why did you and Brick suddenly decide to drive up from New Orleans? Maggie: For your birthday, what else? Big Daddy: I had a birthday last year and the year before. I didn't see ya then. Maggie: Well, you know how Brick is sometimes. Big Daddy: Maybe he thought he was comin' to my funeral instead of my birthday? Maggie: Why Brick loves you! Well he does. Big Daddy: But does he love you? Maggie: What do you want - Truth? Big Daddy: If I was married to you three years, you'd have the livin' proof. You'd have three kids already and the fourth in the oven. Brick: (detached) Give me my crutch, Maggie. Maggie: Lean on me, baby. (He turns and stiffly ignores her) (She warmly hugs him from behind) You've got a nice smell about you. Is your bath water cool? Maggie: Well, what's the difference!